Can a new “fish hub” revive the Monterey Bay fishing industry? 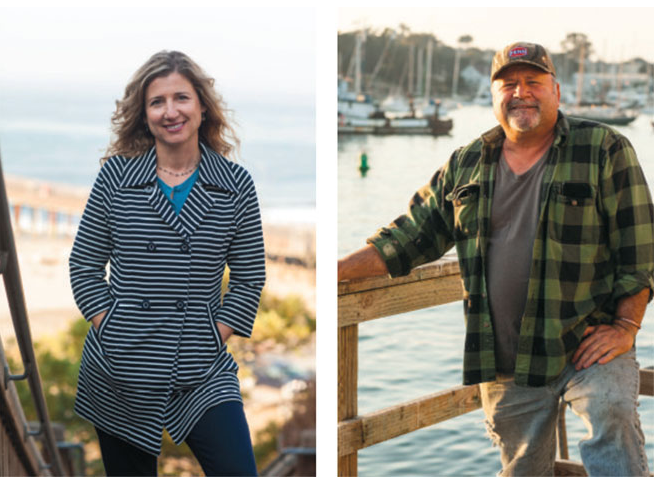 Reviving an industry: Monterey Bay Fisheries Trust executive director Sherry Flumerfelt, above left hopes a new “fish hub” will help create the increased demand for local fish that fishermen like John Pennisi, above right, need for their fishing businesses to thrive. Third-generation Monterey fisherman John Pennisi is preparing to relaunch his boat, The Irene’s Way, after eight years of keeping it docked. “It’s almost like starting all over again,” he says. Pennisi’s return to fishing Monterey’s waters, hopefully by early 2018, is part of a wider comeback for the Monterey Bay fishing industry that is being nurtured by the Monterey Bay Fisheries Trust. In partnership with the City of Monterey and the Monterey Bay Aquarium, the nonprofit has spent the last year developing plans for a “fish hub” designed to jumpstart Monterey Bay’s struggling fishing business—with an initial focus on Monterey harbor, and an eventual goal of spreading the benefits to Moss Landing and Santa Cruz. To be successful, the hub will need to address both the proverbial chicken and the egg, simultaneously boosting both the supply of and demand for fish harvested from our local waters. The idea is modeled after “food hubs,” hundreds of which have cropped up across the country in recent years. “A food hub can range anywhere from somebody on a telephone connecting producers with buyers to a full-scale building with refrigeration, processing, trucks, distribution, ice and a retail space,” says the trust’s executive director, Sherry Flumerfelt. Fish hubs are a newer concept but the intentions are similar. Following a feasibility study finished in June, the trust decided that the fish hub’s first step, by early 2018, will be to hire a full-time value chain coordinator whose priority will be to rebuild connections between fishermen and buyers. Stories like Pennisi’s sparked the initial idea for the project, and feedback from him and others has shaped it along the way. Growing up, Pennisi couldn’t wait for school to get out so he could race down to the docks and climb aboard his family’s fishing boat. He and his brothers, including well-known fisherman Giuseppe “Joe” Pennisi, never doubted that they’d become fishermen, too. “We were so proud to be able to follow in the footsteps of my grandfather and my father,” says the 54 year old. Years later, Pennisi’s own sons aspired to carry on the family tradition. But by the time they came of age, it was a floundering business. “They were right behind me up until the disaster hit,” Pennisi says. The Pennisis are groundfish trawlers, fishing for about 60 different bottom-dwelling species including halibut, sole, sanddabs and rockfish. For decades, this provided them with a happy and stable life: Pennisi’s parents owned a popular fish store, Royal Seafood Market, at the wharf in Monterey for 50 years, as well as a fish freezer plant. Between its members, the family owned six groundfish trawlers. But the life they’d known became endangered around the new millennium, when trouble struck the West Coast groundfish fishery—one of the most significant fisheries in the Monterey Bay. “It was poorly managed and, over time, fish stocks started to become depleted and fishing businesses started to shut down,” says Flumerfelt. The federal government declared the fishery a disaster in 2000, and nine groundfish stocks were deemed overfished. The Monterey Bay Aquarium’s Seafood Watch program placed many of the groundfish species on its “Avoid” list. The loss of the groundfish fishery was particularly painful, as it had provided local fishermen with a bountiful source of year-round income, unlike seasonal fisheries, like those for Dungeness crab and salmon. Eventually, the fleet of local boats fishing out of Monterey Bay—once numbering in the hundreds— dwindled to a fraction of its size. As local fishing diminished, suppliers of cheap imported seafood stepped in, and local markets and restaurants started offering mostly fish from other regions and abroad. As a result, buyers solidified relationships with those distributors, and customers lost their appetites for many types of local seafood like petrale sole or black cod. “They don’t know what it tastes like to eat rockfish—its more exotic to them than eating tilapia from China, even though it’s from our backyard,” says Flumerfelt. But over time, the groundfish fishery experienced a remarkable recovery. Thanks to cooperation between regulators, fishermen and environmental groups, by 2014 it had bounced back to such an impressive degree that the Marine Stewardship Council certified the fishery as sustainable, and Seafood Watch upgraded 21 species of groundfish from ones to “Avoid” to a “Best Choice” or “Good Alternative.” And thanks to an initiative by the Monterey Bay Fisheries Trust, valuable government-established fishing quotas were purchased and held in trust to be leased back to local fishermen, ensuring that they could afford to compete with outside interests for rights to harvest local fish. Still, the recovery has come at a cost. Monterey Bay fishermen now navigate a steep set of regulations and requirements, such as paying to have a federal observer aboard on each outing. “Local fishermen are arguably the most highly regulated industry in the world,” says Flumerfelt, and that adds to their expense of doing business. “These fishermen are fishing sustainably and responsibly and making great investments in doing so, but not necessarily being rewarded in the marketplace,” she adds. The initial version of the fish hub will focus on tackling these issues. Once the value-chain coordinator position is filled, that person will work on establishing relationships along the supply chain. “If there is demand, then fishermen will start getting up and running again, and you’ll be able to afford an ice machine, and you’ll be able to get a processor, and everything will start to fall into place again,” says Flumerfelt.